Friday, Nov. 24th 2017, at 17:30 at AQSHF's cinema comes the 35mm print of Costa-Gavras classic 1969 political thriller Z. Based on events surrounding the assassination of a Greek politician and the judge who tries to uncover the truth, it won two US Academy Awards and the Best Actor prize for Jean-Louis Trintignant along with the unanimous Jury Prize at the Cannes film festival. 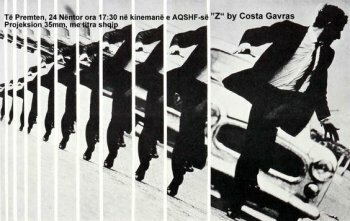 Made during the height of Greece's military dictatorship, Z is considered to be one of the masterpieces of world cinema. The print in the AQSHF archive has rarely been shown and is the original French language version with Albanian subtitles.